In varying k from k = 0 to k = 1 slowly, and solving for the optimum (b, w) at every step, it's possible to find the ratio of Grain's utility to the initial value ofWood or Brick's utility. When this is done, a smooth curve is formed which shows that the most utility – relative to Brick and Wood – Grain can get of the system occurs when wood and brick are complementary goods. Also, the only case in which there are no potential gains from trade is when the goods are perfect substitutes. Figure 4: The ratio of Grain's per-period utility gained from trade to the maximum profit of Brick of Wood without trade as a function of k, i.e. u((π→, k)/qB,Wk. This graph demonstrates the relationship between substitutability and how profitable creating an elementary system of promissory notes can be. 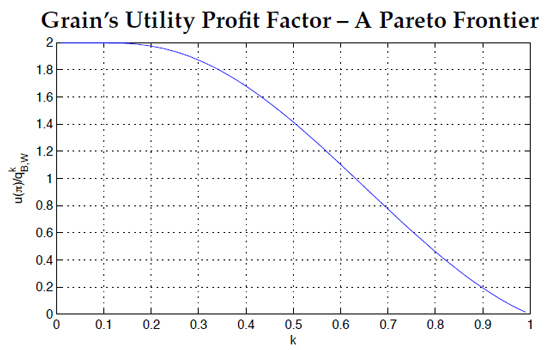 At the center, where k = 1/2 (as in the trade before), notice that the value of the ratio is √2. This result that the profits from trade using money is highest when the goods themselves are complements is relevant to the history of money. During the development of early economies, there was an expansion of productive processes that required complementary inputs. For example, for a specific amount of obsidian a corresponding amount of sinew and wood was required to craft a spear. How ever much more sinew or wood one was granted, the crafstman could not create another spear until all three production inputs were provided in acceptable proportions. In the transfer from early hunter-gatherer societies to agrarian ones it is consistent with the history to suppose that the development of technology could be represented in the four-merchant model as a gradual decrease in k for individuals in the habit of creating finished goods. Since the rewards to being the middleman in such a case would be higher, it's possible that the role of trader itself was created in part by the increasing complementarity of production inputs. This is consistent as the time period (circa 2,000 BC) gives us ample examples of markets, and the emergence of organized production requiring multiple inputs. Thus, a simple model of credit money based on actual ancient loan contracts lends support to the credit theory narrative of money, yields gains from trade higher than those from barter, and exhibits features consistent with the history of production technology. In the model, it is unlikely that Sheep would go long before realizing that Grain was benefitting from issuing her promissory notes. In response, Sheep could do the same thing, issuing promissory notes with slightly more favorable terms. Since preferences are homogeneous, and we already know the utility from Grain's profit, the solution to this problem is merely a game of descent on the manifold of Grain's profits (see figure 4). This competition is a form of Bertrand competition since Sheep and Grain are only choosing the denomination of their credit tokens, meaning that they're setting the exchange rate between Brick and Wood. In other words, Sheep and Grain are price-setters. With no collusion, it is clear that Sheep and Grain would reach an equilibrium outcome where neither of them makes a profit, as in the standard two-firm Bertrand case. Because there are so many examples of catalogued primitive currencies, and because the ways in which they are used are so widely varied (Einzig,1966), it is difficult to conclude with a strong statement that solving inefficiencies of barter with a medium of exchange never led to improvements in trade, or that it was never a part of the emergence of money in the three function definition. However, ancient Babylon is rich with historical examples of credit that lend themselves much more fruitfully to the thesis that wide scale trade did not encounter a significant double coincidence of wants problem. Instead, there were large institutions which set the precedent for the modern economy by establishing weights and measures, and that only after such units of account were in place did media of exchange fully take off. In the history of civilization, the kingdoms of mesopotamia occupy a unique position. They are regarded as the first political organizations to have organized written systems of law in recorded history. Of the several thousand contract documents that survive from the era (2000 1600 BC), a majority of them concern loans (Skaist, 1994). As the cuneiform that was impressed into the clay to record these transactions has survived the millenia that followed their use, many researchers have had the time to study them and interpret their use in Old Babylon. The employment of these contract loans predates the development of true coinage by at least a millenium, and therefore offers insight into the early development of money, at least insofar as it concerns facilitating trade through the convention three-function definition of money. In the four-merchant model, players were situated around a mountain and thus could not communicate. On the watershed of ancient Babylon, there were no such mountains. However, the mountains did not play a role in inventing credit money in the Four-merchant model – they simply set the stage for competition between Sheep and Grain. All that was required for credit money to emerge was for a trading intermediary to connect trading partners and realize profits due to the complementarity of those goods. In ancient Babylon, the financial transactions of the day were legally tended to in temples and by temple scribes. 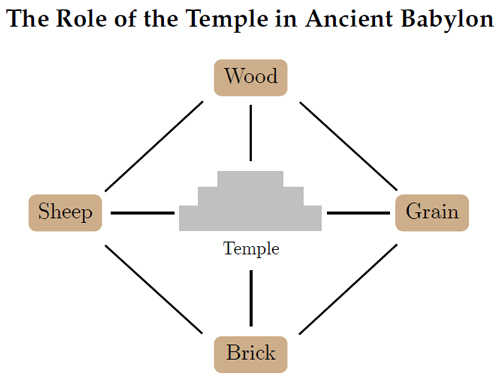 The temple was not only a religious center with economic and legal obligations: the religious and the commercial spheres were not separate, and this is no better evidenced than by the fact that some loan documents have gods as creditors, and other documents formulate vows to the gods in legal loan terminology (Harris, 1960). On the whole, the temple was an institution with pervasive legal authority and influence, and a perfect candidate for the birthplace of money and banking. With the temple at the center organizing loans, the potential of the temple to make profits from trade are enormous. If any two economic actors in the society produce complementary production inputs, the temple has the potential to make profits both by loaning out production inputs at interest and by using a credit-money system to facilitate trade. As an entity with the legal power to levy taxes, the Babylonian temples thus had both the legal authority and the economic power to standardize weights and measures and codify units of account. Clearly, credit was pervasive in the babylonian economy. In the archives of two babylonians SI.A-a and Turam-ili, a shepherd and a merchant, loans account for 68% and 17.5% of the respective documents (Garfinkle (2004, pg. 24)). Although Garfinkle cautions us to remember that "the surviving texts may not be an accurate reflection of the original volume or importance of any one particular activity within the economies of the households under consideration", the fact that a larger share of the Shepherd's documents were loan contracts captures the fact that facilitating trade was not the exclusive role of those people we might commonly call merchants. The distribution of loans in ancient Babylon is very indicative of the role of individuals and institutions, rather than markets, in creating financial devices that fulfill the goals of money. Credit and financial instruments in ancient Mesopotamia were pervasive and inextricable from the development of commodity money as a unit of account. In ancient Babylon, barter was likely present but evidently was not a factor in large commercial operations. At the time, Babylonian society was far more sophisticated than a simple collection of independent producers stockpiling for trade with each other. The prevailing socioeconomic hierarchy made such concerns obsolete by codifying tributes paid to the kingdom and the temples. Trade in such hierarchies thus never faced the double-coincidence problem in any significant way. Remarkably, through this hierarchy and the standard measures it imposed, a vast capitalism flourished in the fertile crescent with the establishment of contract law. Babylon set the stage for millennia of economic history with its economic and legal traditions at a time when the legal concept of money dealt primarily with payment of debt. Thus, the history suggests that money did not originate (at least in the middle east) as a solution to the inefficiencies of barter. Mathematically, gains from trade via the Four-merchant model suggest that money originated more along the lines of institutionalized units of account, and credit, than by barter. Credit solves a broad class of problems, present in every economy, that barter can not. When a trading intermediary has no purchasing power, but is credit-worthy, it is still possible for them make a profit using credit: here barter has nothing to say. Barter, when viewed within the broader scheme of financial instruments, is an extreme case of credit where a loan is paid off instantly with some agreed upon interest and on specified terms of payment. To suggest that trading intermediaries were limited to such an extreme modus operandi ignores the historical reality that they were not. Thus, the codification of the loan contract in ancient Babylon, when combined with the historical evidence and simple thought experiments about the viability of credit, demonstrates that credit systems are a more historically and theoretically viable starting place for the emergence of money than barter.